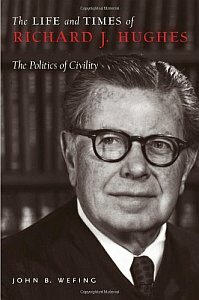 Richard Hughes was elected governor in 1961, selected as the Democratic nominee by party leaders after their first choice, Attorney General Grover Richman serving under the outgoing incumbent Governor Robert Meyner, suffered a heart attack. At the beginning of the campaign, Hughes was so little known among the general public that Time magazine ran a profile titled "Who's Hughes?" Hughes, however, long had been active in Democratic politics and had served as a Superior Court judge and in various party positions in Mercer County. Despite his low level of recognition as he began his race, Hughes won a 34,920-vote upset victory over Republican James P. Mitchell, who had been Secretary of Labor in President Eisenhower's cabinet. The surprise win by Hughes was attributed to his energetic campaign and outgoing personality, coupled with Mitchell's limited appearances due to a broken leg he had suffered early in the contest. Once elected, Hughes demonstrated concern for addressing long-deferred state problems, a contrast from the frugal policies of Governor Meyner resisting new spending. In his two terms as governor, Hughes increased funding for services for the handicapped, improved education and created the state's county college system. 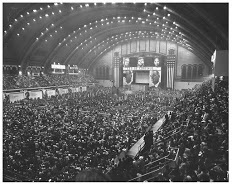 In 1964, Atlantic City served as the site of the Democratic National Convention, a selection which state and local leaders had hoped would gain national attention to renew interest in the resort. The attention, however, became largely negative as the deterioration of the City's hotels and other amenities was highlighted in reports by attendees and the media. Hughes stood for re-election in 1965. Rather than a referendum on state tax and fiscal policies, the focus of the campaign unexpectedly turned to the national controversy created after a Rutgers faculty member, Eugene Genovese, said at a teach-in on the Vietnam War that he did not "fear or regret the impending Viet Cong victory in Vietnam." Despite pressure, Rutgers President Mason Gross refused to dismiss him and the Governor rejected demands by his Republican opponent, state Senator Wayne Dumont, to intervene to force Esposito's firing. In November, Hughes was re-elected to a second term by 350,000 votes. Later in the 60's and into the following decade, however, Genovese's anti-war views would become more widely accepted. In September 1970, Rutgers students occupied the Old Queens building housing the central administrative offices for the university's president and other top officials in a two-day protest against the War. In August 1971, 28 anti-war protesters were arrested for breaking into selective service offices in Camden and destroying draft records. The 28 people, called “the Camden 28,” was comprised of four Catholic priests (including Daniel and Philip Berrigan), a Lutheran priest, and 23 Catholic laypeople. After a trial of three and a half months which received national media coverage, the jury found the defendants not guilty--the first complete legal victory for the anti-war movement. At the commencement of his new term, Hughes again turned to seeking enactment of an income tax, hoping for support from the Democratic majorities in both chambers that he helped elect. The tax bill was approved by the Assembly, but fell one vote short in the Senate. After the defeat, the Governor reluctantly signed a bill instituting a 3 percent sales tax--the state's first broad-based tax. 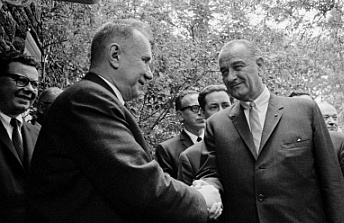 On June 23, what was then Glassboro State College (current Rowan University) hosted a hurriedly-convened three-day summit meeting between President Lyndon Johnson and Soviet President Leonid Brezhnev. Glassboro was selected by the State Department due to its location midway between Washington and the UN headquarters in Manhattan, where Brezhnev was scheduled to speak. The summit was intended to further discussion following the increased diplomatic contacts which had occurred between the two countries earlier in the month after the outbreak of the Six-Day War between Israel and Arab countries. Although no major agreements were reached, the overall amicable exchanges led to the meeting being described as producing "the spirit of Glassboro" increasing hope of later improvements in relations. Three weeks after the global focus on New Jersey during the Glassboro Summit, the state received more unwelcome attention with the outbreak of the Newark riots. The disturbances began on July 13 when two white Newark policemen arrested a black cabdriver for improperly passing them, with later unsubstantiated rumors that while in police custody the driver had been beaten and killed. Crowds began to destroy property and attack the police, with Governor Hughes responding to Newark Mayor Hugh Addonizio's request for assistance by dispatching the National Guard to the city. By the sixth day of riots and looting, 24 civilians and police officer and firefighter had been killed, along with destruction of many stores and other buildings in the central business district. The violence began to subside after the governor and other state officials eased their initial harsh tactics in confronting the situation and reached out to black ministers and other community leaders to begin a dialogue on the causes of the protests. After the Newark riots began, similar disorders broke out in Plainfield for three days, again leading to mobilization of the National Guard by the Governor. One police officer was killed by a mob after he shot a young black man. In April 1968, Governor Hughes signed legislation creating the Hackensack Meadowlands Development Commission to oversee reclamation and development of 21,000 acres of public and private land in the Meadowlands. The Meadowlands, a wetlands subject to tidal flows which made much of the area property of the state government, had long been viewed as a swamp of little value. From colonial times, it had become a favored site for illegal dumping of both solid and chemical waste, polluting the water and soil with high levels of mercury, lead and other toxic chemicals. The new agency launched extensive programs to bar continued dumping followed by longer-term efforts to clean up the existing pollution. For the first time in the state's history, the legislation also established a system under which the 14 municipalities in the district shared in property tax revenues from future development.